Gregory McHuron painting the Chapel of the Transfiguration at last year’s “Artists in the Environment” event in Grand Teton National Park. 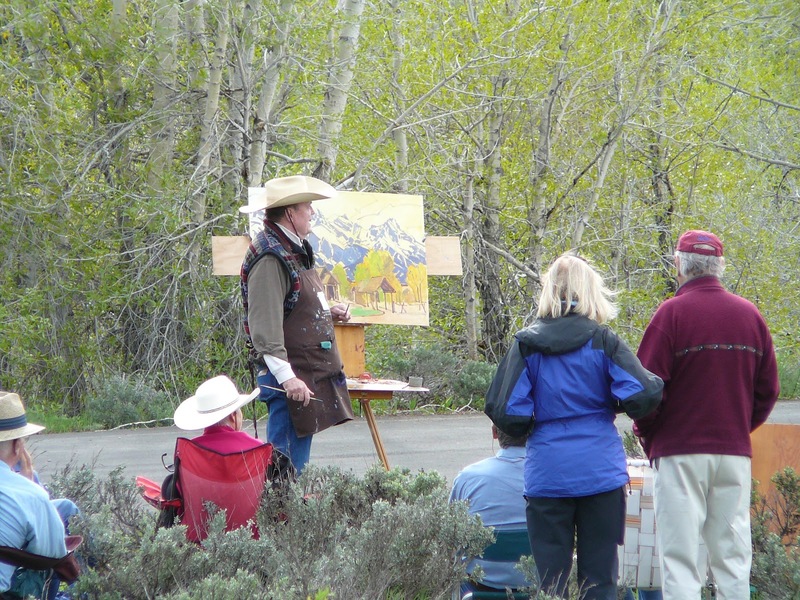 The Grand Teton Association invites the public to join world-renowned artist Gregory I. McHuron, for a live plein air painting demonstration at Grand Teton National Park’s Blacktail Pond, one of the Park’s most beautiful overlooks. The event is free and open to the public. McHuron will paint on site Saturday, June 9, 2012, 4:00-7:00 pm. A leader of Jackson Hole’s plein air painting tradition, Greg McHuron primarily paints wildlife and landscapes throughout the United States and Canada. Classically trained, McHuron is a master draftsman and favors capturing the natural world using oil paints and watercolor/gouache. A co-founder of the Grand Teton Association’s “Artists in the Environment,” (he shares the achievement with renowned plein air painter Conrad Schwiering) McHuron began sketching at an early age. His interest in wilderness and wildlife propelled him to graduate from Oregon State University with a degree in Art, and a curriculum emphasis in Forestry, Fisheries and Wildlife studies. McHuron has taught workshops, given demonstrations and participated in quick-draws for a variety of organizations including the Wyoming Artists Association, Wind River Artist Association, Scottsdale School of the Arts and the Lodge at Palisades. The National Museum of Wildlife Art, CM Russell Show, Grand Teton National Park, Isle Royale National Park and Gates of the Arctic National Park and Preserve all include McHuron’s work in their permanent collections. About the Series: “Artists in the Environment” is funded by the Grand Teton Association, an organization whose purpose is to promote appreciation, understanding and enjoyment of the Grand Teton National Park and the Greater Yellowstone Area. Free to all, viewers are invited to bring a chair, a snack, and those who would like to are welcome to paint alongside the artist. Look for the big, bright “Artist’s Demonstration” banner!